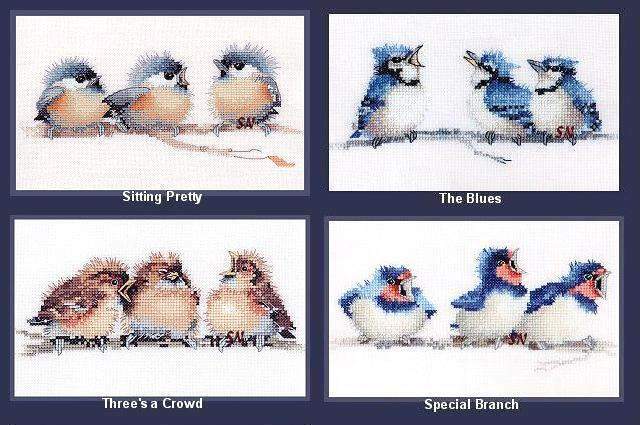 These designs, published by Heritage Stitchcraft, are based on the wonderful, delicate designs by Valerie Pfeiffer. When we display the models in the shop or at shows, they just draw people right to them! If these aren't the cutest little people... they are each only 2 x 3 inches in size!!! Presented as small charts, they are coded for DMC floss, and each pattern has two charts -- one that highlights the cross stitches, the other that highlights any backstitching. 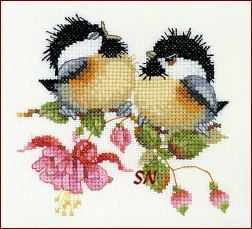 Absolutely precious, the birds are also offered in other larger designs by Valerie -- pictured on our inside pages. They are 'kind of pricey' -- we are aware of that -- but I guess it's less expensive than planning a trip to the UK just to bring a few home! From the artwork of Valerie Pfeiffer -- aren't these a riot??? 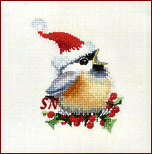 Finishing only 3-1/2 x 3-1/2 -- these are not large... but they make up for that in personality! Stitch one for the enthusiast in your life!!! Presented as small charts -- each has one for the crosses and another to highlight the backstitching. Coded for DMC., and yes... a little on the pricey side of charts, but that's life! We've had this little guy for some time... and I was going to put him up on the website early this summer... but the timing didn't seem right... 105 degrees outside! Anyway, I kind of forgot about him, till we were doing our 'pre-sale cleaning!' 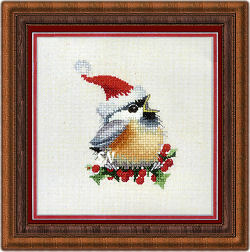 He's one of Valerie Pfeiffer's darling little birds... singing Christmas Songs!!! 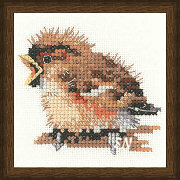 Offered as a chart, he finishes approx 3 x 3 on 28 or 32ct, and is stitched in DMC flosses. I think he's precious... and I didn't want another year to go by without giving him his little place of honor on our website! Bluebell Chick-Chat is one of the four newest VP bird duets! 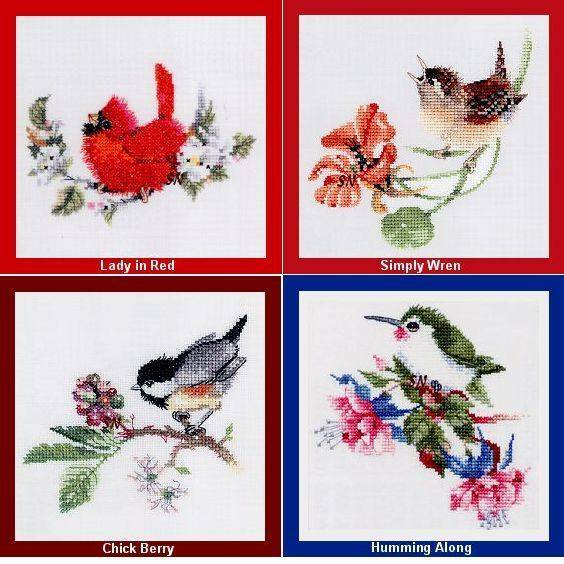 Absolutely DARLING... this set of four couples perched on their favorite branches, is colorful and charming! Offered as charts, each finishes only 4 x 4 on 28ct -- so they are VERY 'do-able!' (not full of displaced or half stitches, either!) 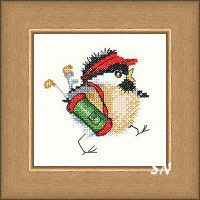 Delightful little birds with 'fluffy' feathers, their facial expressions make them seem human. In Fuchsia Chick-Chat -- doesn't Lefty look like he's singing at the top of his lungs... and his partner, Righty, is really mad about all of it??? Then, look at Rose Chick-Chat... I think that little bird is sleeping!!! The colors in these are always spectacular, as is the shading. Choose just one or all four, they are adorable! 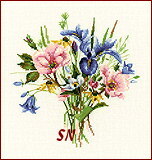 This is a classic set of elegant floral posy designs. Cross Stitch charts from the original artwork of Valerie Pfeiffer, each is fresh, crisp, and beautifully balanced. Offered in chart format, each finishes approx 8 x 8 on 28ct, and calls for DMC flosses. Stitch one or make the set... they are all just breathtakingly beautiful! A new Valerie Pfeiffer Trio of babies is here!! 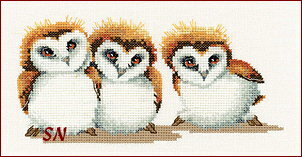 The cross-stitched version of Valerie's original artwork, our three baby owls are soft, fluffy, and oh-so-curious! 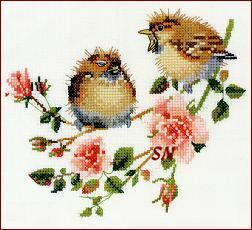 Just like the rest of the trios series, these are offered as a chart, and when stitched on 28ct, finish approx 3-1/2 x 7-1/2 inches. Huge chart, very, very clear, these are darling!!! Remember those little 'Sitting Pretty' birds, that everyone loves??? Here are more of them!!! A limb featuring six tiny songbirds... just look at them! Each is talking to the other... but that middle pair is the cutest... he's just looking straight at us!!! Offered as the chart, Chorus Line finishes approx 3-1/2 x 13-1/2 on 28ct. Full of delicate shading, the tiny straight stitches on their heads and bodies just make them the fluffiest little babies!!! 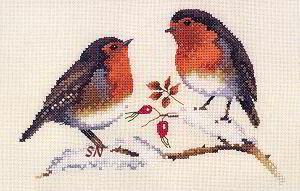 The newest duo of birds charted for cross stitch from the artwork of Valerie Pfeiffer, these two are a pair of subdued winter friends! Finishing approx 5 x 7 on a 28ct, the shading is beautiful, and the colors are rich! Small enough to actually get finished before the winter season is all over... these are peaceful and utterly charming. 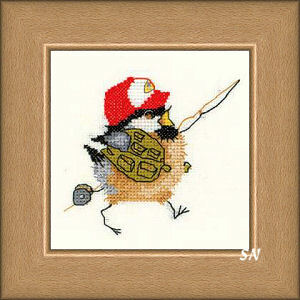 There are quite a few other bird-offerings below... take a peek! 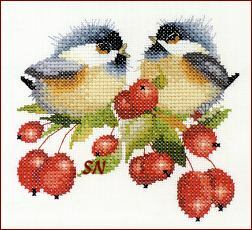 Darling little birds are perched on their branches, chirping to each other!!! Joining the collection of Valerie's birds, these two are just as charming as the rest of the collection -- I think it's the 'sticky-outy' feathers on their heads and breasts that add to their character! 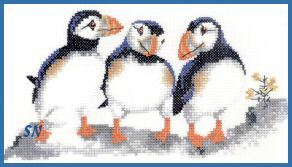 A trio of sweet Puffins looks to be discussing dinner plans, but they could be flirting with one another, too! Stitched on 28ct white linen, they measure approx 4 x 8 ... and make wonderful companions to the other 'Trio' designs in this collection! 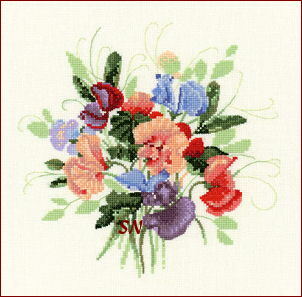 Lots of partial cross stitches -- easier to stitch over a two-thread fabric rather than an aida weave -- give Valerie's designs such graceful shape and color shading details. The chart is huge, and very clear, too! 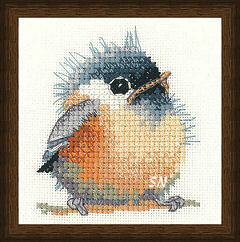 A new trio of darling little birds has arrived just in time to stitch for a sunny plant window! Beautifully charted, they measure approx 4 x 8 on 28ct white Lugana. 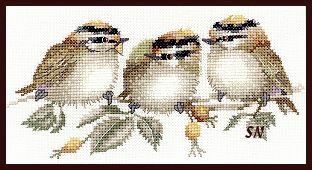 The 'fractional cross-stitches' featured in the design -- which are all diagrammed clearly -- give these birds such charm and detail! 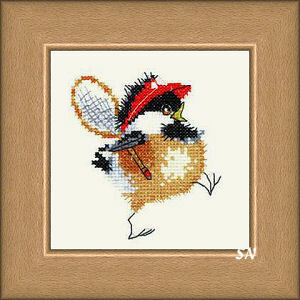 Available as a chart, Story Time joins quite a collection of Valerie's birds... it's hard to choose a favorite! This is the cutest little baby cardinal chirping away! 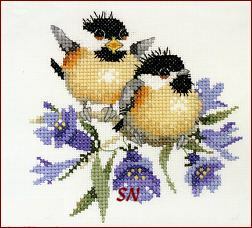 One of this set of four small bird designs, finishing approx 5 x 5" these have incredible detail because of the fractional and straddled cross stitches that are involved. 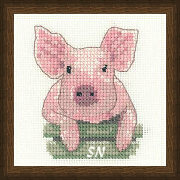 Nothing hard... just cross stitches that don't always fill the entire square, or backstitches that cross over at strange angles. The slight variations really add to the softness of these, and gives them such charm! 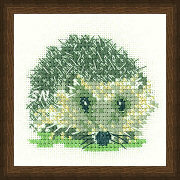 Each is available as an individual chart, with beautiful graphics and instructions from Heritage Stitchcraft of England. Click the image above to see both designs in the Solos series. 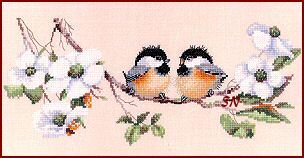 Each design is a darling trio of fluffy baby birds, perched on a twig, just chirping away! 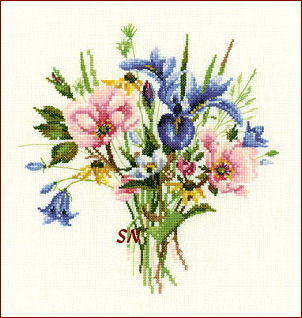 Stitched on 28ct, they're teeny little things -- finishing approx 3" x 8". Beautiful colors, they are charted from Watercolor paintings by Valerie Pfeiffer. Four in this series of Trios, click on the image to see the rest! Each of the four is available as a single chart. Click the image at right to see all 4 designs in the Trios series.